The UK motorcycle industry has experienced a significant rise in sales, reaching its highest annual figures since 2012. In total, more than 118,000 new motorbikes were sold last year, up from the near 105,000 units sold in 2015. That means the UK new bike market is busier now than it has been over the last five years but how has the market changed? With the exception of 2013, when total two wheel sales in the UK fell by 1.9 per cent compared to the year before, the new motorbike market has grown year-on-year since 2012. The biggest jump in sales happened in 2015 when the total number of new registrations increased by 12.7 per cent to 115,000 sales. And this rate of growth was almost replicated in 2016 when the number of new bikes sold grew by 11.7 per cent. So, what’s causing the big spike in popularity? We spoke to Stevie Muir, from the Motorcycle Industry Association (MCIA), and she believes that cost is the biggest factor. 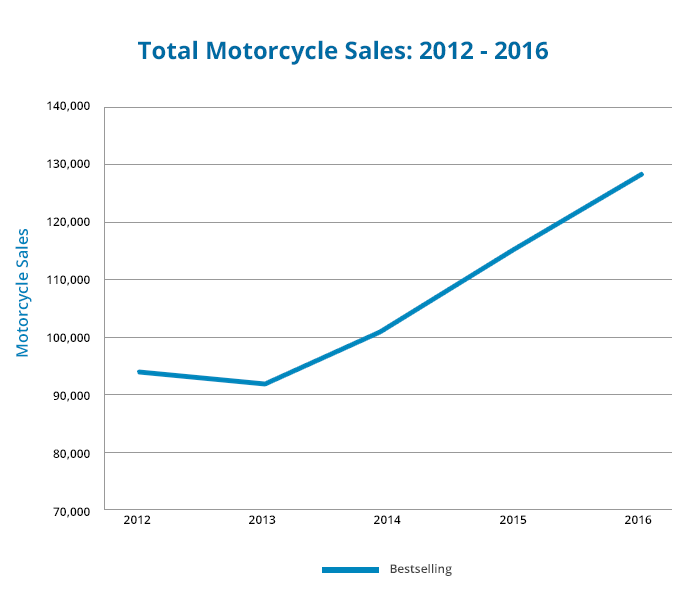 While sales of almost every type of new motorcycle increased in 2016, it’s nakeds that experienced the biggest growth. In total, 35,651 nakeds were sold in the UK last year, up 18.3 per cent on 2015 figures. But it’s no flash in the pan for nakeds either – they’ve been outperforming all other types of bikes for the last three years. How did the rest fare? Scooters may have taken a dip in 2013 when sales dropped 4.4 per cent on the year before but things have turned around since then. In 2016 scooter new registrations rose to 27,482, a 19.6 per cent increase on the 22,970 units sold in 2015. 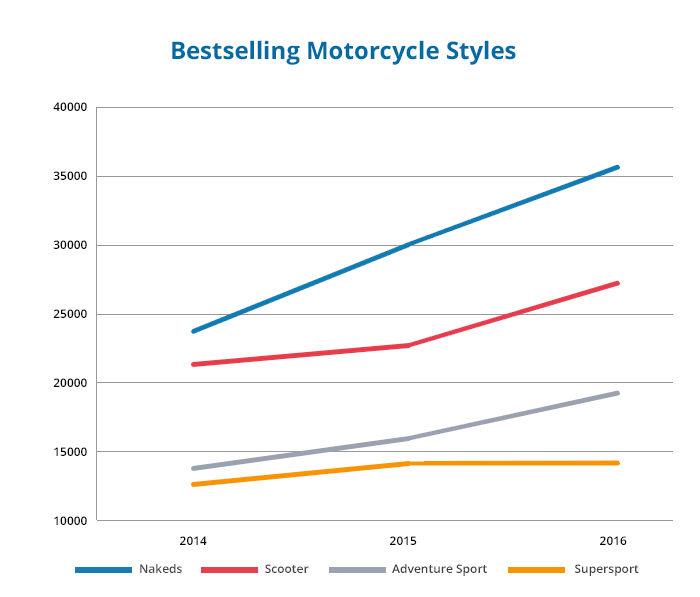 Adventure Sport sales grew by 11.1 per cent compared to 2015 and Custom styles were up by 14.2 per cent. The Supersport category took a turn for the worse in 2013 when sales dipped to 11,716 from 12,315 the year before but that’s not the end of it. Since then it’s been a steady rise upwards with more bikes being bought year-on-year, resulting in 13,485 models sold in 2016. But while motorcycles are becoming more and more popular, there are some types that aren’t appealing to the masses. The sales figures for new Sports Tour bikes have hovered around the 4,000 mark for the last five years and this year dropped to their lowest, with just 3,946 units being shifted. Touring models have also struggled, with total sales for 2016 being the lowest since 2012 after a 6.4 per cent decrease from 2015 took the number to 2,431. Before that, touring model sales dropped by 15.7 per cent between 2014 and 2015, the only style to experience a dive in sales that year. Small capacity engines have taken a dive in popularity over the last five years. Sales figures for 0-50cc engines have decreased year-on-year since 2012 and 2016 is no different, with new registrations down 5.3 per cent on the year before. But the buck stops there as all other engine bands experienced an increase in sales over the past year. 126-650cc engines had the greatest rise by 18.2 per cent, and motorbikes with engines of 51-125cc were the most purchased with 50,680 sold in the UK. Engines in the 651-1000cc band ended 2013 with a 3.8 per cent decrease in popularity but that didn’t last long. By the end of 2014 sales of 651-1000cc engines had rocketed by 18.3 per cent and in 2015 this jumped up by a further 24.9%. Honda was the bestselling motorbike manufacturer in 2012 and the Japanese brand has managed to maintain its stronghold on the UK motorcycle industry, consistently selling the most bikes annually and shifting 20,495 in 2016. 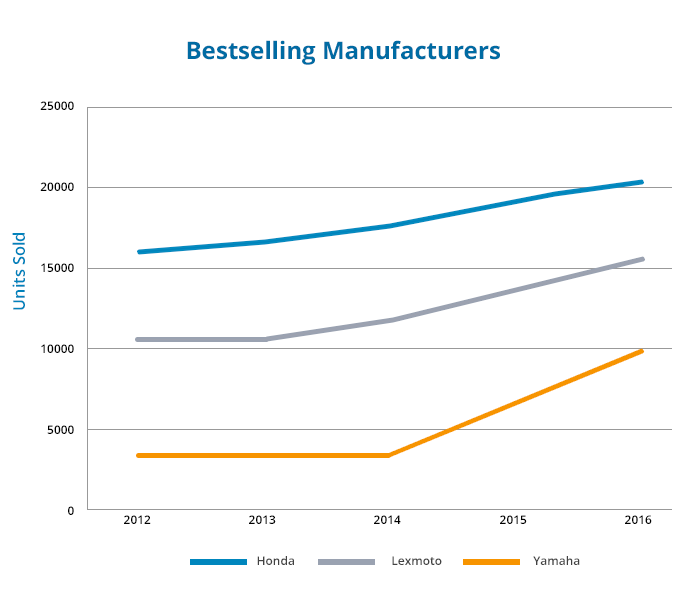 Yamaha placed second in 2012 sales and, like Honda, repeated this trend through to 2016 where 16,040 models were sold, a 49 per cent increase on 2012. But it’s Lexmoto who has experienced the largest growth, selling 10,852 motorcycles in 2016 compared to 3,007 in 2012. This growth is most apparent in 2015 when sales jumped by 116 per cent, from 3,127 to 6,753. And this staggering 261 per cent increase since 2012 is enough to position Lexmoto as the third bestselling motorcycle manufacturer in the UK in 2016. *All figures here relate to new registrations and do not include used sales data.